Windsor Lakes is a wonderful gated enclave of 572 homes within the The Woodlands, Texas, 40 miles north of Houston. Residents of this active adult community enjoy first-class amenities and activities. Homes are located on private lots which feature beautiful native landscaping. Residents at Windsor Lakes enjoy a village-like atmosphere where they have the opportunity to obtain everything they need or want right outside their doors in The Woodlands area. Everyday residents of Windsor Lakes enjoy an exciting lineup of fun activities, community events and social club meetings. The Windsor Lodge is the 20,000 square-foot clubhouse which is exclusive to Windsor Lakes' 55 and over population. This beautifully designed center of activity comes complete with a fully equipped exercise room, including treadmills and weights. For rest and relaxation, Windsor Lodge offers billiard rooms with pool tables and a dart board. An arts and crafts room caters to the hobbyists. A library with computers enriches the minds and lets the residents stay up to date with what is happening, nearby or far away. For socializing and entertaining, Windsor Lakes residents can enjoy the multi-purpose room. A stage and catering kitchen can accommodate small and large gatherings, with an audio and visual room at full disposal for maximum entertainment. The friendly Texas weather also begs for outdoor enjoyment. An outdoor pool, and walking and biking trails allow Windsor Lake residents to do just that. Many residents love to enjoy the parks and natural spaces while mingling with the other Windsor Lakes inhabitants and proprietors in the surrounding Woodlands communities. Windsor Lakes was completed fairly quickly with Lennar starting development of this 55 and over community in 2003 and finishing it in 2006. Most units feature desirable granite countertops with high-end stainless steel appliances. These energy-efficient homes also have private fenced back yard and double pane windows. Homes in Windsor Lakes are available only on a resale basis. Single-family homes start at 1,739 square feet and go as high as 2,666 square feet.The smaller homes, also called Patio Homes, start off a little smaller but are still very roomy ranging from 1,491 to 2,210 square feet in size. Regardless, these homes are spacious with two and three bedrooms. Windsor Lakes features a full-time activity director and a variety of social clubs. These currently include regular clubs representing interests for bridge, poker, dance, dinner, exercise, garden, activities, readers theatre, and French. The homeowners' association fees are quite reasonable and include yard maintenance, basic cable, exterior painting, sprinkler maintenance, and home security. This allows residents more time to enjoy their favorite pastimes within Windsor Lakes. Windsor Lakes in The Woodlands, Texas is located a half mile west of Interstate 45, just off Highway 242. The immediate area is fairly commercial with apartment buildings, a Lone Star college campus, and St. Lukes Hospital only minutes away. Windsor Lakes residents have the option to not have to go farther than The Woodlands when it comes to covering their daily needs and wants with so many regular and specialty shops just outside their front doors. Just to the north, the suburban city of Conroe, Texas features many major restaurants, an assortment of ethnic cuisine, and lots of shopping opportunities. Lake Conroe, the Crighton Theatre, and the Cynthia Woods Mitchell Pavilion are just some examples of the biggest attractions. 40 miles to the south, Windsor Lakes residents can enjoy entertainment and nightlife on an even larger scale in Houston, Texas. From visits to the space center, touring countless museums, sampling lots of venues for live music, to enjoying a multitude of parks - it will be impossible to run out of things to do. 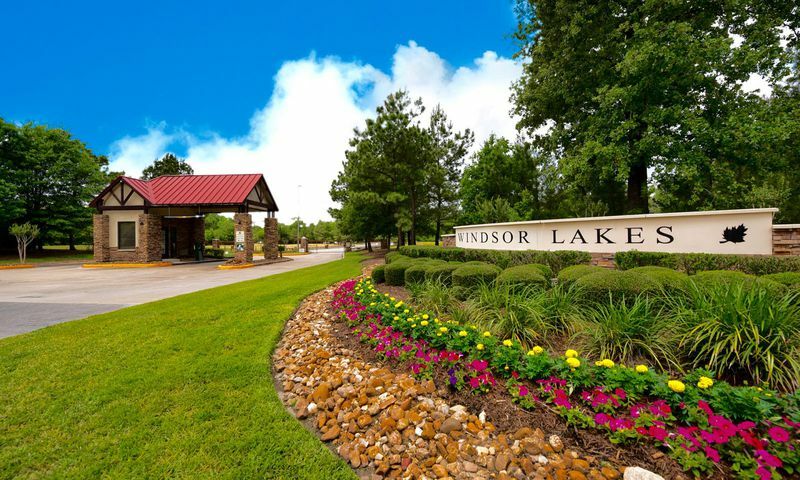 Windsor Lakes is an ideal active adult community in the Houston area that is close to shopping centers, restaurants, medical facilities and entertainment. Windsor Lodge - 20,000 Sq. Ft. There are plenty of activities available in Windsor Lakes. Here is a sample of some of the clubs, activities and classes offered here. The smaller homes, also called Patio Homes, start off a little smaller but are still very roomy ranging from 1,491 to 2,210 square feet in size. Regardless, these homes are spacious with two and three bedrooms. The homeowners' association fees are quite reasonable and include yard maintenance, basic cable, exterior painting, sprinkler maintenance, and home security. Please Note: Not all floor plans are shown below. When we first moved here everything seemed great. Price was good, location was good, area was good. Then we started having problems. Water was constantly shut off for whatever reason. I get it that sometimes it needs to be turned off do to working issues but no one ever knows when it will get turned back on. Everyone has a different story. Currently, we have been without water for almost 12 hours and no one seems to be working on the issue. Water issues have been the biggest issue for us living here. Also, the pool has only been open half the time it was suppose to be open. Every time we tried to go they were always working on it and we never got notice until we walked to the club house. They are quick to take your money and charge you a late fee but not fix the issues that need to be fixed, especially the emergency issues. We have lived here for 9 years and can't imagine our life anywhere else. We absolutely love living here. There are so many activities constantly going on, including very reasonable priced bus trips to sporting events, cultural events, casinos, etc. We get the greatest value we've seen anywhere for our monthly fees, including yard maintenance, refinishing of front doors, repainting of the exterior of the homes, security system, re-fencing, not too mention all the common areas. Plus, this is a gated community with the increased security that comes with that. We are in very close proximity to 4 (!) top hospitals, a plethora of shopping & restaurants, movie theaters, etc. We have a large lake nearby and a short drive to Houston & Galveston, where there are many cruise ships available. Homes range up to 3000 sf. We have many singles living here who also take full advantage of all the social & recreational activities. Homes for resale tend to be few and they tend to move very fast. The people here tend to be very friendly & sociable. We hope to welcome you to the neighborhood soon! Very friendly, beautiful community. Well maintained, lots of activities. Glad we chose to come here. Homes sell quickly...not much turn over. Really like this community and it's location to shopping and freeway access. Nice clubhouse with lots to do. I have been looking for a ranch home in this area and just looked at a couple resale options at Windsor Lakes. The homes look very well built and the community is nicely landscaped. All the homes have larger, established trees and plantings so the community feels more established. Being in a gated community is also appealing to us. This community could be a winner, I just wish there were more homes on the market right now to check out. We might wait another month just to see if anything else comes along. 55places.com is not affiliated with the developer(s) or homeowners association of Windsor Lakes. The information you submit is distributed to a 55places.com Partner Agent, who is a licensed real estate agent. The information regarding Windsor Lakes has not been verified or approved by the developer or homeowners association. Please verify all information prior to purchasing. 55places.com is not responsible for any errors regarding the information displayed on this website.